Watch a live demonstration of the Beagle USB 480 Protocol Analyzer capture and debug data from Freescale's Kinetis K40 Microcontroller Tower system. This video also features the Aardvark I2C/SPI Host Adapter and the Beagle I2C/SPI Protocol Analyzer. See how packet truncation can allow for significantly longer captures and how saved USB configurations can be used to apply class-level decoding to captured data after a capture. Do you have suggestions for other enhancements to our software or products? If so, just send your ideas to sales@totalphase.com. One of the fastest growing applications for Total Phase products in the I2C bus and SPI bus protocols is the programming of Flash memory. 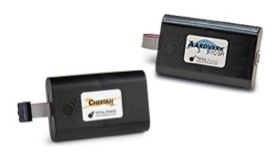 The Aardvark (I2C/SPI) and Cheetah (SPI) host adapters are used in conjunction with our Flash Center and Control Center software applications to program a wide variety of I2C and SPI memory, and we've recently added native support for the full line of Spansion memory and the most popular Microchip products. Additionally, our framework easily allows you to add your own parts to the library, effectively enabling our tools to program an incredibly wide variety of I2C and SPI Flash memory. As we've expanded the portfolio of natively supported parts, many customers have requested additional memory package formats to be supported in our Flash Socket boards. We would like your help in determining which new socket sizes should be added to our product line. Please take a moment to complete this very short survey and let us know what Flash memory sockets would be useful to you. As a 'thank you' for completing the survey, you'll receive a coupon valid for a 10% discount in our web store on the purchase of any Aardvark or Cheetah products (including dev kits). Additionally, Four (4) lucky people will be selected at random from the responders to win a $25 Starbucks card. We'll publish the survey data in our next newsletter. 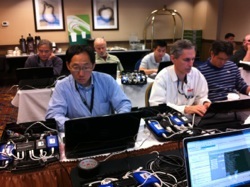 Total Phase hosted our first hands-on training class of the year on May 22nd in Santa Clara, CA. We followed up with a second session in Santa Ana, CA on June 5th. Attendance was excellent and participants used Total Phase tools to analyze and identify bugs while implementing their solutions on the Renesas RX63N RDK. The tools used in the class included the Beagle USB 480 Protocol Analyzer, the Beagle I2C/SPI Protocol Analyzer, and the Aardvark I2C/SPI Host Adapter. The session introduced Total Phase tools and after a review of protocol basics, participants were tasked with identifying and fixing two bugs in the design. The class was very popular and for those that were unable to attend we will be hosting additional sessions in the future. We will host more classes covering the same material, so please check our website, blog, Twitter, or Facebook to find out when the next class registration is open! If you are interested in a training session in your area, email us at sales@totalphase.com. Interesting Customer Idea thanks to Colin O. Using GPIO and triggers (data or packet type matches) to trip a flag in your debugger – Know exactly where a bug exists in your code.